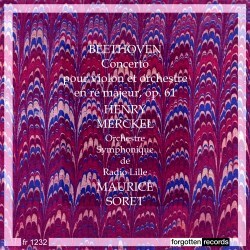 It would be good to think that some enterprising label would reissue Henry Merckel’s 1941 recording of the Beethoven Concerto, made by French HMV with the Lamoureux Orchestra conducted by Eugène Bigot. It’s one of the more intractable items from his select discography, his other major concerto and sonata undertakings having largely seen the light of day. Which is where this unexpected survivor comes in. It was recorded in concert in January 1953 in Lille at almost the same time that Henryk Szeryng was recording the same work in the studio in Paris with his sometime mentor Jacques Thibaud conducing. Merckel, meanwhile, did much for new French music, premiering works by Jean Hubeau, Jean Rivier, Robert Casadesus and Stan Golestan amongst others but he was also an assured exponent of the central canon too. Even at this stage in his career, Merckel (1897-1969) could summon up that inimitably sweetly lyric tone, warmed by a quivering intensity that was so much his own. As I’ve commented several times before when reviewing his discs, his sound world is intensely piquant, his fast vibrato and quick slides adding personalisation to his playing. His phraseology is apt to be vocal, spun on a wavery thread of sound, enriched by expressive finger position changes. Here his first movement second subject is decidedly languorous with some daringly extreme dynamics. I think he plays the Léonard cadenza here. Things aren’t always well orchestrally speaking, and Bigot’s brow must have furrowed in the orchestral introduction and again when cueing the horns in the Larghetto: they sound as if they’d been enjoying rather too much to drink beforehand. But Merckel’s playing is immensely sympathetic, rich in pathos and full of his characteristically vibrant phrasing. He no longer summons up quite the charisma of his pre-war self, but his technique is still resilient. The finale is heavy going in places, orchestrally speaking, but the soloist surmounts most difficulties without undue concern. The end is greeted with warm applause. There is some high level hum on the surviving tape – I assume it’s tape and not a transcription or acetate – as well as some little recurring thumps. There are no notes, as usual with this label, and no other works as companions for the Beethoven. This is hardly an epochal performance. The recording has some underlying limitations, and the orchestra is run-of-the-mill. But Merckel still emerges with a considerable quotient of his earlier self intact. No longer quite the wizard of the early 1930s he is still technically highly capable and musically responsive and characterful. He never played a dull note and those of us who admire him, as I do, should be thankful that this rare document has surfaced.